Arches were first developed in Ancient Greece and later the Romans refined the structure. Arches became an important part of cathedral buildings and are still used today in some modern structures such as bridges. These also find widespread use in home constructions where apart from acting as support structures they serve to beautify the building. Decorative Architectural Shapes Arches are well suited to larger spaces as they spring from around six inches from the ground and curve in a way that gives adequate headroom for passage below. Thus the ceiling height must be enough for these dimensions to be accommodated. Too many arches in a small room may also be overpowering just as different varieties will be discordant. Ideally, when used minimally as an element of décor or in situations of structural requirement the Decorative Architectural Shapes Arch is a great solution with multiple benefits. 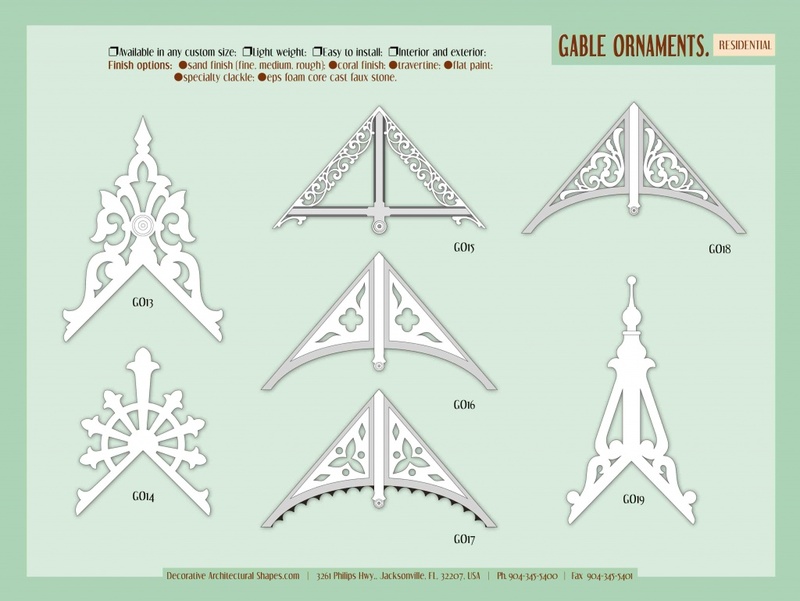 The configuration of Decorative Architectural Shapes Arches is dependent on where they are used, the load they carry and the aesthetics required. The most common are the jack, segmental, semicircular and multicentered in buildings. The familiar one is the semicircular, due to its high structural efficiency though all the others are just as beautiful when used in buildings. 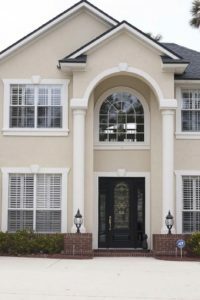 At the entrance door, the curve of Decorative Architectural Shapes Arch can make an elegant, sophisticated and rich accent to your entrance system. 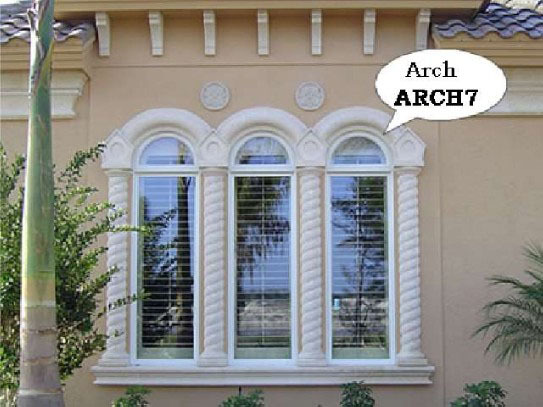 Within the home, Decorative Architectural Shapes Arches can still be used as doors or dividers of spaces. 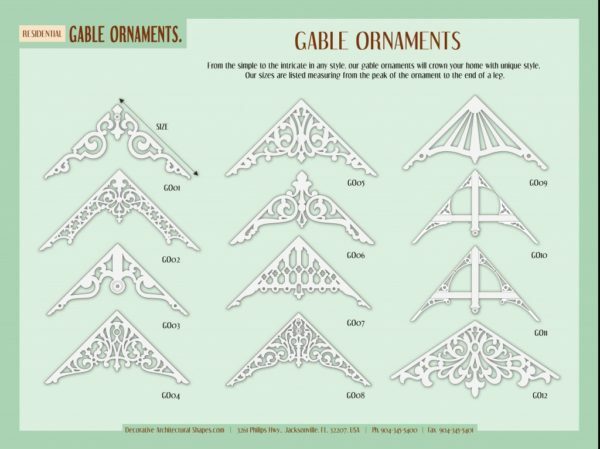 To add a designer touch the vertical supports of the Decorative Architectural Shapes Arches can be used as niches to place artwork and highlighted with focus lights. This not only enhances the simple aspect but unity, balance and proportion are upgraded due to the character lent to the simple arch. In architecture, an arch is a curved object that is utilized to span an opening as well as to support weight from above. 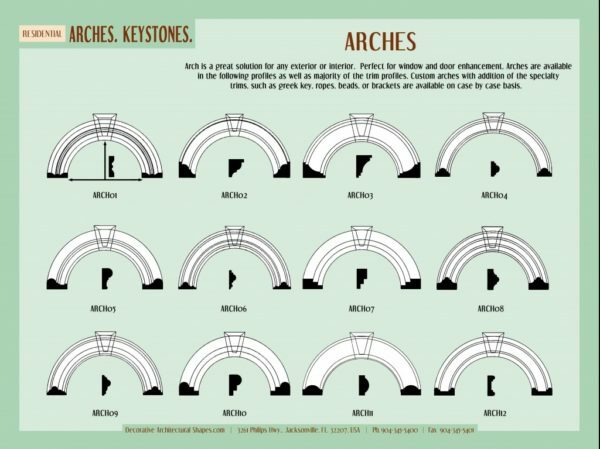 The construction of arches is considered to be difficult, due to the fact that an arch is held in its place by the weight of all of its members. The arch has been discovered in numerous different cultures and dates back to as early as Mesopotamia. The Greeks typically used arches for practical purposes, and the Romans later expanded on their ideas designing and building more elaborate arches. 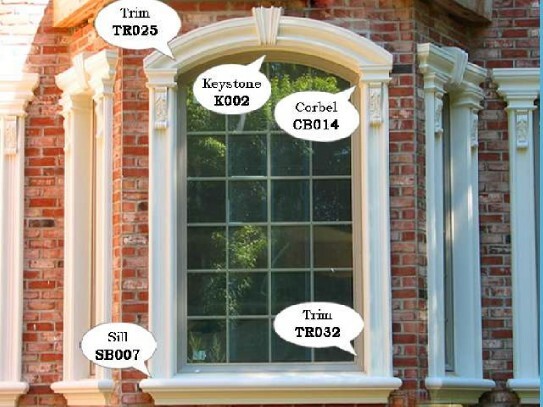 Stone arches are generally used in both stone and brick structures, over door and window openings, for porches, and anything your mind can think of. The arch has been the strongest design known to man since the Roman times. 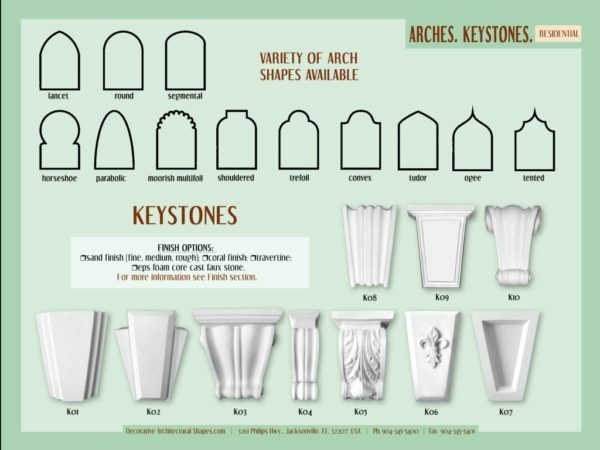 Decorative Architectural Shapes arches made to your exact specifications to span a door, window, wall panel exterior & interior or driveway. Sometimes arches are applied to the surface between the columns to give the impression they’re all supporting one another. The Basket arch is a flattened arch whose ellipse like shape is determined by three arcs that are interconnected; with each radius being drawn from a different center. This arch is also known as a Semi elliptical arch or an Elliptical arch. This simple type of arch is mainly used in modern day building. The flat arch is a straight horizontal arch consisting of reciprocally supportive wedge shaped blocks. Arches with small rise to span ratio. These arches are also known as Jack arches and are very similar to French arches. 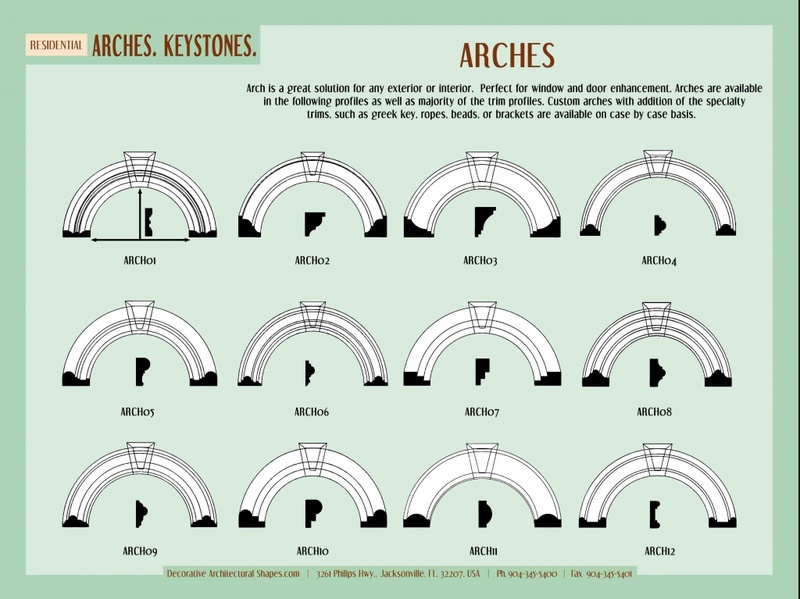 A French arch is also a flat arch constructed of wedge shaped materials but also have a center keystone. 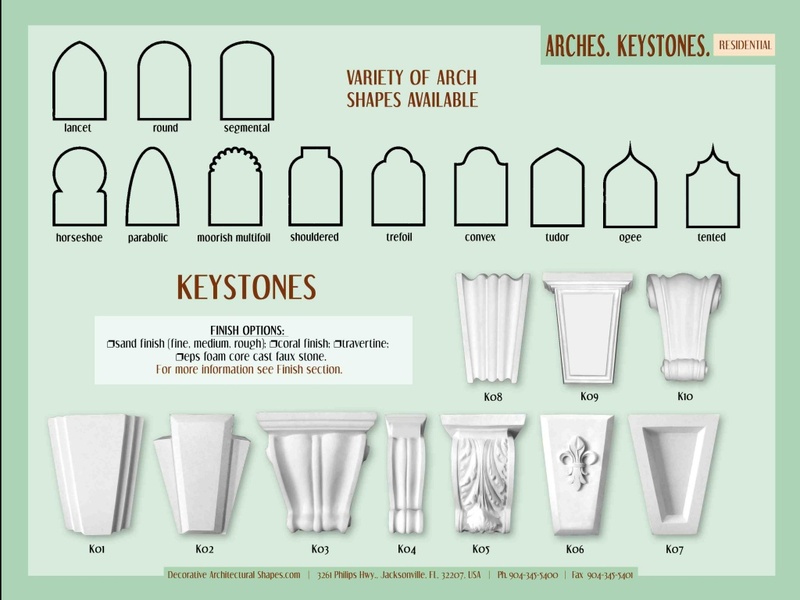 A Gothic arch is a pointed arch; one which has a joint instead of a keystone at the apex. Gothic architecture, which the Gothic arch originated from, emerged after the Romanesque style of Norman architecture. The term Gothic architecture is used to describe building style which was used in the time period between 1200s and 1500s, when the arch was designed. The Horseshoe arch also called the Moorish arch and the keyhole arch is the traditional arch of the Islamic architecture. These arches are said to originate in Visigothic Spain. Horseshoe arches have an intrados that widens above the springing before narrowing to a rounded, lobed or pointed crown. Common in the 21st century building. The Ogee arch is a pointed arch which has an S- shaped curve on both sides. The Ogee style which this arch was founded from was introduce in the 1300’s and was popular throughout the late middle ages and in the fourteenth century in England. The style is also associated with the Venetian Gothic style and the arch also resembles the Gothic arch. A Roman arch is a very common and one of the first arch designs. This is a semicircular arch. Romans were architectural geniuses and build large structural buildings that carried a heavy load; this is where the arch came into the design to allow for opens while dispersing the weight evenly. The Tudor arch is a low oblique or pointed arch; generally drawn from four centers. The four radii define the arch, starting from a small radius to switch from the left vertical to a large radius with its center in the right half of the opening to define the top portion of this arch. This is reflected on the opposite side of the arch. Our buildings capitalize on this strength providing clearspan buildings that are inexpensive to put up, but can stand up to earthquakes, hurricanes, tornadoes, or anything else mother nature can throw at them. Installation of architectural foam moldings is much easier than stone. There is no need for large crews, heavy equipment or running the risk of chipped pieces being delivered. Lightweight and available in hundreds of different shapes and forms, pieces are simple to maneuver and cuts labor costs in half.